Having players like Zlatan Ibrahimovic in MLS may prove damaging for United States in the short term, but head coach Gregg Berhalter thinks the potential gains for the national team are unprecedented. 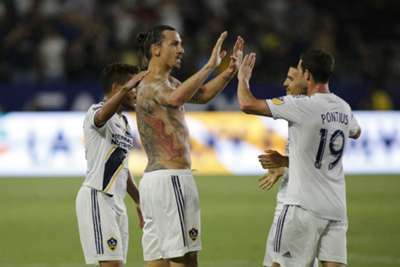 Ibrahimovic arrived at LA Galaxy last March and on Tuesday it was announced he would remain with the club for the 2019 season, signing a new contract that made him a designated player despite links with a return to AC Milan. The Swede took the league by storm with an incredible debut double against Los Angeles FC and went on to tally 22 goals in 27 appearances, though he could not lead the Galaxy into the playoffs. While the presence of experienced, high-profile players hinders the national team at the moment by making it harder for young players to break through, Berhalter believes there are myriad positives that can help take the national team to new heights. "There is that issue in the short term. When you continue to spend on foreign players it's going to be harder for Americans to get on the field," the former Columbus Crew boss told Omnisport on a conference call. "I think that's a short-term problem because the quality has improved in MLS, it's a better league than it was five years ago. "This influx of money into the roster has improved the play, has improved the quality. I think in the long term the Americans that will get on the field, it's going to help the national team, it's going to help develop them to levels that we haven't seen before." Luring elite veterans has been a long-time ploy for MLS clubs, but Atlanta United showed you can enjoy success with a different model in 2018. In just their second season in the league, Atlanta stormed to MLS Cup glory following a focus on signing youthful South American talents like Miguel Almiron, Hector Villalba, Josef Martinez and Ezequiel Barco. On what he felt the superior philosophy was, Berhalter said: "There's no one right answer. What works for one club might not work for another, but once you see the contribution of Zlatan to the league, and you see young players get to see what he can do up close, it's amazing. "And then when you also think about some of the young players that have come into our league and how they've been able to perform and raise their level and perhaps move to other leagues, that's a great story as well. "Wayne Rooney is another example for DC [United], who came in and really made a big impact and changed the culture there with how he was working and how he's playing on the field. "There's different ways to achieve success and I think the diversity of options is what makes this league special."